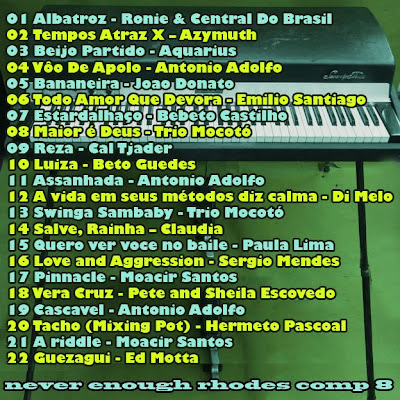 We're back to Brazil again for this eighth compilation in the rhodes series. Some jazz, some funk, a bit of samba and some amazing orchestration .. I'll let the previews talk for me today, but take my word for it that this one is hot, so give it a try! .... and leave a comment - you know that we bloggers go crazy unless you do :) Even if just to say "Your cover design's improving a little". Nice post, can't get enough of Brazil. I keep downloading and thanking you!!! i appreciate it gianni, thanks to you (and travis) for commenting. right on! Looking forward to this one, your comps are great. I couldn't agree more. Your compilations are terrific. There are so many terrific songs on this one. 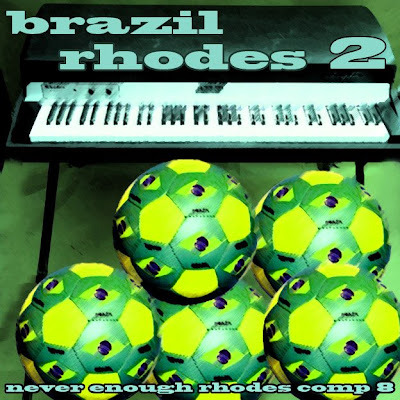 The Di Melo song is one of my all time Brazilian favourites (it is also on the indispensible Blue Brazil 2 compilation). The Antonio Adolfo songs are also great. And the Paula Lima song, WOW!!! I'm still waiting, however, for some songs of my favourite female singers to be included in one of your Brazil compilations, like Elis Regina, Nara Leao or Claudette Soares. Any chance? Looking forward to the next Brazil compilation. And keep up the good work. I'm always thrilled when there is a new post on your site. I could do a comp like Jur is asking about. My interest tends to "contemporary traditional" rather than "worldbeat" ie. with the accent on acoustic roots music. swboy, I would be very honoured if you could do such as compilation. There is so much great Brazilian music that could be included. Back in the pre-internet days it was quite difficult to get your hands on Brazilian music in the Netherlands. I bought most of my music on vacation in Paris and Lisbon. Nowadays great Brazilian songs are all around the blogosphere. Sometimes I feel like a kid in a candy store not kowing what to taste first. I'm really curious to hear your favourites, swboy. Sorry if I wasn't clear swboy - I was just saying to contact me via email so we can work out how/when. Hear from you soon! I really dig your comps. Great selections, smooth flow. Great blog this, so much to discover! Thanks very much for putting all of this together!